Quicksilver inspiration, preternatural artistry, and laser-focused drive against a backdrop of allies (Philip Treacy), loyal assistants (Sebastian Pons), ambivalent observers (Detmar Blow), and demons within (depression, drugs) and without (the fashion calendar)—the rapid rise and demise of Alexander McQueen is told in trenchant documentary form by Ian Bonhôte and Peter Ettedgui, co-directors of MCQUEEN. Showing us the personal and professional clashes that marked his brief tenure as fashion’s leading enfant terrible, the film also takes the audience inside McQueen’s process and provides a ringside view of his iconic runway shows. In one of the films most dramatic scenes, McQueen’s close but contentious relationship with benefactor Isabella Blow comes to a head in rare footage shot at the Blow estate in Gloucestershire. 10850 Pico Boulevard, Los Angeles. Photographs by Ann Deniau, courtesy Bleecker Street. This entry was posted in FASHION, FILM and tagged Alexander McQueen, Detmar Blow, Ian Bonhôte, Isabella Blow, McQueen (Bonhôte and Ettedgui), Peter Ettedgui, Philip Treacy, Sebastian Pons on July 20th, 2018 by Barlo Perry. We hope he changes his mind, but Daniel Day-Lewis has—for now—retired from acting. Vicky Krieps co-stars as Woodcock’s muse Alma, and Leslie Manville as his sister and business partner Cyril. Anderson regular Jonny Greenwood composed the score. Following the screening, the film’s costume designer Mark Bridges will participate in a Q & A moderated by journalist and filmmaker Matt Tyrnauer. PHANTOM THREAD, Tuesday, December 19, at 7:30 pm. 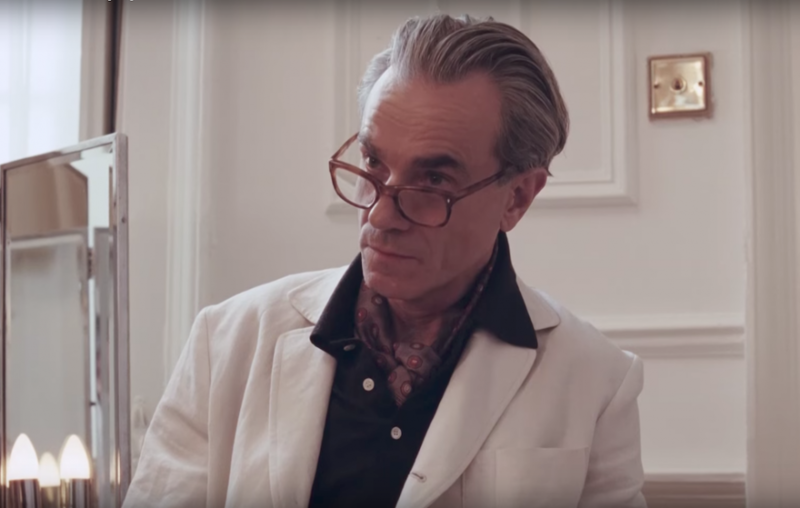 Daniel Day-Lewis as couturier Reynolds Woodcock in Phantom Thread (2017). This entry was posted in FASHION, FILM and tagged Alexander Fury, Alexander McQueen, Billy Wilder Theater, Cristóbal Balenciaga, Daniel Day-Lewis, Hammer Museum, Jonny Greenwood, Leslie Manville, Mark Bridges, Matt Tyrnauer, Norman Hartnell, Paul Thomas Anderson, Phantom Thread (Anderson), Vicky Krieps on December 17th, 2017 by Barlo Perry.